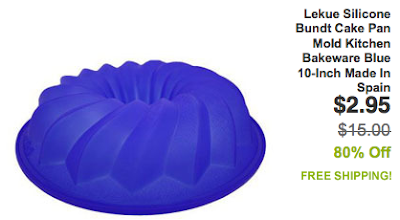 Silicone Bundt Cake Pan only $2.95 w/ Free Shipping! Wow, today only at eBay Daily Deals, you can get a silicone bundt cake pan for only $2.95 shipped! NOTE: You can find this deal by clicking on the green "See more" button in the "Best Deals from DealGenius" category. This sale is only available to eBay Daily Deals members, so you'll need to sign up first to get them. Click here to get it or for more info!